After a summer of festivals for each barrio it is all brought to a close with La Mercè – Barcelona’s very own festa major. The festival is a celebration of the Roman Catholic feast day of Our Lady of Mercy, (La Mare de Déu de la Mercè in Catalan) on September 24th. This first became an official holiday in 1871 but most of the present day events really began to take shape in 1902. 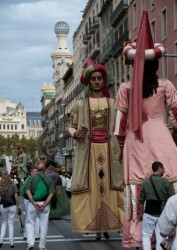 This year the festival runs from the 21st – 24th September 2012. Although there are many events either side of this. There are many hundreds of events this year. So do check out the festival programmes to make sure you get to see the things that interest you. Unfortunately they seem to have only produced it in Catalan this year. Expect to see the Sardana, the popular Catalan dance, performed throughout Barcelona. The castellers produce their incredible human towers. And the papier maché giants parade around the city. Sounding strange enough yet? There is the Catalan wine and cava fair at Arc de Triomf that is well worth a visit. This is a change of location from previous years when it was down at Port Vell. The 32a Mostra de Vins i Caves de Catalunya is on Passeig de Lluís Companys, the bit between Arc de Trimof and the park, all weekend. Buy a glass and some tickets and take your pick from the many wines and cavas on offer from the region. The BAM Festival is back with more than 40 musical acts over the Friday, Saturday and Sunday. The Kooks from Brighton, England are playing on Saturday night at the reinvented brewery to music venue, Antigua Fabrica Damm. And you can always dance away until the early hours at Parc del Fòrum. See the separate BAM Festival programme. What can I say about the correfoc. A feature of many a Catalan festival the correfoc really comes into it’s own at La Mercè. Groups of people dressed as devils run down the street with catherine-wheel type contraptions attached to long poles. Fireworks set off amongst the crowd. Fire (or spark) breathing dragons trundle down the streets. My first year here I was absolutely blown away by the utter mayhem of it all. It is an experience not to be missed. But if you are of a nervous disposition then do stand well back. Via Laietana like you’ve never seen it before! 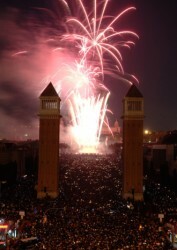 The Piromusical de la Mercè, a display of water, music and fireworks at the Magic Fountain at the bottom of Montjuïc is the perfect way to round off the weekend. 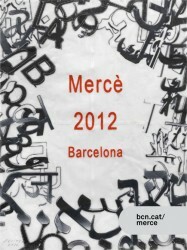 This year’s poster has been designed by Jaume Plensa. Barcelona is a desire, an idea. I like to imagine the city as a place of fusion and exchange between people from all over: cultures, races and traditions that dissolve into a single body that beats and breathes to the sea. Languages and alphabets embracing and merging to create a fabric full of windows looking out on to the future. The voice of the people is the real architecture in which we live and love. Barcelona is a voice made from voices. Barcelona is a dream made from dreams. For the first time La Mercè has apps! Yes that’s right, for smartphones. Click the App Store or Google Play buttons below for either iOS or Android versions of what is basically the festival programme on your phone. On the nights of the 23rd and 24th September there will be a non-stop, all night service on the Metro. There will also be extra buses on selected routes. Check out the www.merce.tmb.cat website for details. And if you happen to have 18 mins and 58 secs of your life to spare watching this extraordinarily long promo video then please let me know if it’s worth it in the comments. I only managed to get to 6 mins 4 secs!